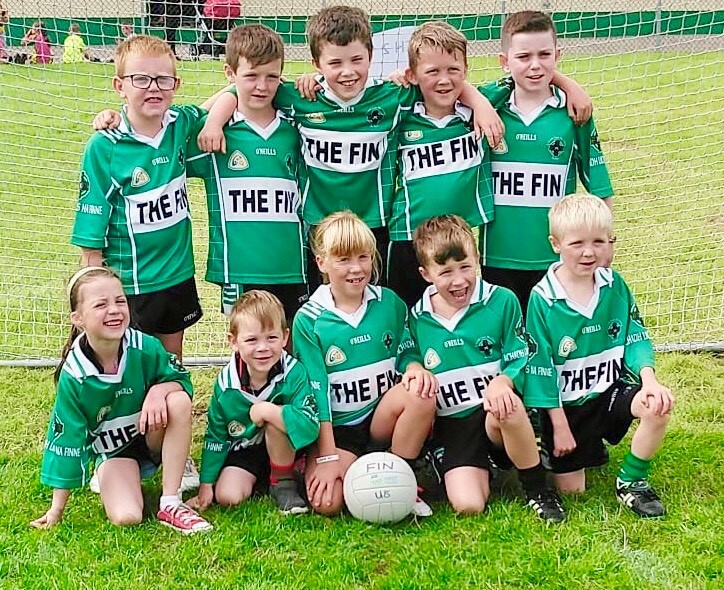 Aughlisnafin U8.5s who enjoyed the Go Games Blitz in Liatroim on Saturday morning. *Ballylough Minors lost their opening championship game last Tuesday evening at Pairc Naomh Eoin. Both sides were level at half time and there was just two points between the sides with time nearly up before the St Peter’s club grabbed a goal that sealed their five point win. Andrew Gilmore top scored with 2-9 on the night and saw two other efforts rattle the crossbar in a game that the Loch could just as easily have have won with a bit more luck on their side. Ballylough are away to Kilcoo on Tuesday night needing a victory to progress to the quarter finals. Despite defeating Kilcoo in the league earlier in the season at Pairc Eoghan Rua this is a championship game and it will be a much tougher assignment but the lads will relish the challenge. *Our U14s finished their league programme with a superb victory away to Drumaness. The win sent them joint top with Bright and both sides will now meet in a league play off decider early next month. The U14’s will now look forward to the championship opener away to St Paul’s on Monday night at 7.30 pm. *Our Year 6’s travelled to Longstone on Saturday morning for their annual U10.5 tournament. Two years ago we won the plate, last year we won the shield and this time it was hoped to go one better, and they very nearly did. The Fin won their group after powering past the challenge of Dundrum, Ballymartin and Kilclief scoring a combined tally of 9-7 and conceding just 2-3. They progressed to the final where they met a Rostrevor side who had also won their group games scoring a combined tally of 10-8. Both sides were well matched but it was the red and black who prevailed scoring a point in each half to win the game while holding the Fin scoreless. It was a gallant performance from all and thanks to Longstone for the invite to take part. Aughlisnafin: R Quinn, O Murray, D Brennan, Dd Steen, J Lenaghan, Dl Steen, C O’Hare (2-1), C Flanagan (1-2), R Croskery (1-1), B Clarke (2-2), D Steele (3-1), S Boden-Hall, E Croskery, A Croskery (0-1). 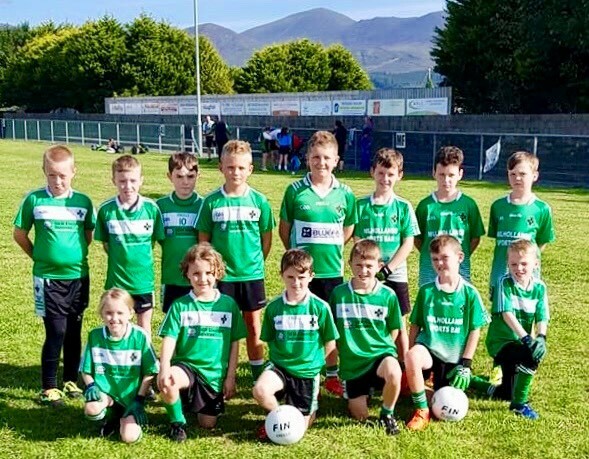 Our U10.5’s will attend the Ballykinlar Tournament this Saturday. *Our Year 4’s enjoyed the Go Games Blitz in Liatroim playing five games in total. Well done boys and girls. *Comiserations to one of our own Morgan Croskery and the Down U16 ETS Footballers who lost against Longford in the quarter final of the Gerry Reilly Competition on Saturday evening in Oldcastle, County Meath. Morgan’s club mate Ethan Lyttle has also been training with the Down U15 ETS squad, while Marc Quinn and Ethan Murray both feature in the U14 ETS squad. It’s great to see these lads representing their club when in the red and black. *The club have a number of upcoming fundraisers. We will be hosting a ‘Pairc Baile Anna Meeting of Families Camp Out’ on Saturday 25th August from 3 pm to coincide with the World Meeting of Families event in Dublin. It will be £15 per tent and all funds raised will go towards the development of our underage teams. We invite all our club members, underage players, their siblings, extended family members and friends. More details on our club’s facebook page. *Other fundraising events include The Donard Summit Challenge on Sunday 16th September and our Wild West themed night in Annsborough Club on Saturday 22 September. *The club are taking orders for their special edition pink Mulhollands sponsored jersey. Contact Jenny Quinn for your requirements before this Friday 17th August. *Lotto numbers 4, 5, 25, 27. No winners. Jackpot £3,650.